The budget MIDI controller market is pretty crowded these days, but Evolution are giving you the most for your money with the UC33, eschewing expensive rotary encoders and large displays for affordable non-moving faders and wipe-clean overlays. Evolution's first foray into stand-alone controller territory was the UC16, which, as its name suggests, has 16 assignable rotary controls, plus a bank of control and snapshot buttons, and a straightforward three-digit LCD display. However, the UC33 under review here is a more ambitious product, with nine assignable faders and 24 assignable rotary dials (hence the '33' of its name), 14 assignable buttons, a custom blue backlit LCD with a further bank of control buttons, and a USB MIDI interface. Most budget MIDI controllers arrange their knobs or faders either in one long line, or in two rows of eight, but the layout of the UC33's controls is more like that of a small mixing console (see above). However, the very first thing you notice about the UC33 when you unpack it is its colourful overlays. These are thin polycarbonate sheets with cutouts for all the knobs, sliders, and buttons, so they drop over the various controls to form a colourful 'front panel'. My review unit came with four, two dedicated to Native Instruments' popular Pro 53 and B4 synths, a generic Mixer Channel Strip, and a blank one that you can write on with a felt tip and then wash clean for use with new applications. Each one is manufactured in a different basic colour, with up to four more colours overprinted to define various panel areas, and to add legends for each control. For instance, the Pro 53 overlay consists of a brown panel with blue areas defining the Poly Mod rotary and button controls, green areas for Osc A, and red for Osc B, while the legends are all in white. This visual grouping really helps you find what you're looking for. The UC33 has a smart moulded silver plastic casing, with a metal baseplate to add some mass. It feels strong enough to last for years in the studio, and (if used carefully) live. However, if it's likely to get drop-kicked at gigs, you might prefer the all-metal cases of some of its competitors. Compared with their keyboards and the UC16, Evolution have changed to an altogether beefier rotary knob design for the UC33 that looks and feel better, although it's a shame that the pointers on the knobs aren't coloured — this would make the knob settings much easier to see at a glance (take a look at our header picture on the left and see if you can tell quickly how the rotaries are set!). The smooth-moving 60mm ALPS faders, by contrast, at least have green LEDs set into their fader caps. Evolution have designated the channel faders as controls 1 to 8, with the associated rotary controls above numbered 9 to 16 for the bottom row, 17 to 24 for the middle row, and 25 to 32 for the top row, with the Master volume fader designated as 33. To the right of the main control area are the display and buttons, including 14 assignable ones which by default comprise four transport controls (numbers 34 to 37), and a 10-key numeric keypad (controls 38 to 47). Also in the assignable buttons section are non-assignable '+' and '-' buttons (which confused me a bit at first). Above these are two rows of four function buttons (about which more later), plus a further row of four quick-access preset buttons for memories one to four. The UC33's blue LCD not only shows the three digits of the current MIDI controller number, but also the Evolution numbers described earlier beneath a small symbol of a rotary knob, as well as various other useful indicators and symbols. For example, a tiny keyboard symbol appears after pressing the Program button, so you can then choose and transmit a program-change message. The back panel (see below) houses a power switch, USB port, MIDI In and Out sockets, and a DC In socket for connecting an external power supply (not included). If you already have a suitable 9V DC 300mA PSU, you can simply use this and the UC33's MIDI Out to transmit controller information without any computer drivers being required. This would suit anyone working live, as well as anyone who doesn't have a suitable USB port on their music computer. Suitable USB drivers are supplied for Mac OS 9.x, X, 10.2, and Windows 98, ME, 2000, and XP, although since all Evolution controllers are 'class-compliant', OS X and XP users can instead use their native drivers. However, the Evolution drivers provide the great advantage of being multi-client. When working with the presets I found this very useful in conjunction with the MIDIOX utility, since I could monitor the UC33's MIDI output while editing software synths in another application. The Evolution drivers also support up to 10 Evolution USB MIDI products, including further UC33s, UC16s, and keyboards. Using the USB drivers also makes your computer 'see' the UC33 as two MIDI input devices — the first for the controller information, while the second passes on data from any device plugged into the UC33's back-panel five-pin MIDI In port. While some other controllers like Kenton's Control Freak provide a MIDI merge function, which makes it easy to plug in a keyboard and end up with combined key/controller output data, in practice most modern MIDI sequencers offer software MIDI merge facilities from multiple inputs, so the UC33 approach shouldn't prove a disadvantage unless you're using it away from a computer. Moreover, on some sequencers, like Cubase VST for instance, allocating a particular MIDI input for automation purposes prevents its data being recorded to a track. There's also a 'MIDI Out from USB' mode switch combination on the front panel. When activated, this disconnects controller data from the back-panel MIDI Out socket, and instead forwards data from the UC33 USB MIDI Out that you'll find in the list of devices on your computer. Effectively the UC33 functions as a one-in/one-out MIDI interface as well as a controller when using the USB connection, from which it also takes its power. I had no problems with the two-stage Windows XP driver installation (the USB driver, and then the MIDI driver), but there is one XP peculiarity not mentioned in the manual. If you subsequently plug in another Evolution device such as a UC16 or MK225C, it will be grabbed by the standard XP drivers and simply appear as a USB Composite device. To make it visible to the Evolution drivers, you need to right-click on this in Device Manager, select the 'Update Driver' option, and then point to the existing Evolution drivers, when it will correctly appear as UC16 (or MK225C) USB MIDI In and Out. Steinberg Cubase channel strip, multi-channel mixing 1-8 and 9-16 (and multiples thereof). Evolution Sound Studio Pro II mixing channel 1-8 and 9-16. Native Instruments B4, FM7, and Pro 53. Propellerhead Reason Mixer, Maelstrom, Subtractor, NN19, Dr Rex, and Redrum. Steinberg Model E and HALion. Waldorf Attack and PPG Wave 2.V. Propellerhead Rebirth master controls synths, and drum modules. User Preset 1, 2, and 3. If you're lucky enough to have a synth or software application already included amongst the factory presets, and particularly if it's one supported by an overlay, getting started is a doddle. There are 33 presets available, and they cover quite a lot of popular software applications (see the box above). All can be selected via the Recall button and the numeric keypad, while the first four also have dedicated quick-access buttons. One of the wipe-clean polycarbonate control overlays supplied with the UC33.However, you can overwrite any of them with your own creations by pressing the Memory button and then selecting a destination using the numeric keypad. Usefully, the current controller and channel settings, along with various others, are preserved each time you power-down, whether you save them or not. The beauty of having 24 rotaries, nine faders and 14 programmable buttons is that a single preset provides comprehensive control over many applications. For instance, using the preset for Native Instruments' Pro 53 with the overlay described earlier gave me full control over the two oscillators, mixer, filter, amplifier, LFO, and the delay effect sections, and although not every parameter is supported, I was soon happily creating new sounds with an occasional stab on the mouse when required. 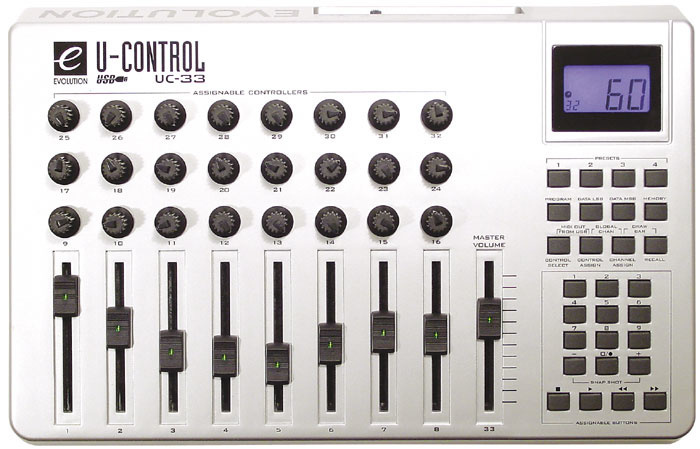 By comparison, a controller like Kenton's Control Freak Studio Edition, with 16 sliders and 16 buttons, provides more thorough parameter coverage by splitting its Pro 53 controls over three 'profiles', although you could program a second UC33 preset with the other parameters if you wished. I then moved on to Cubase SX, where Evolution provide a combined multi-channel and channel-strip file in XML format for both VST and SL/SX/Nuendo. Once you've imported this file into Cubase using the Generic Remote setup screen, you can start using the dedicated UC33 Cubase presets. The channel strip provides full control over the four-band EQ, with on/off buttons, gain, frequency, and Q rotaries, as well as controls for volume, pan left/right, pan front/rear (for surround setups), mute, solo, eight send levels, an output buss selector, and the master volume, while the remaining eight faders act as insert plug-in selectors. I found this very satisfying to use, apart from the last choice, as each accidental move of these faders results in a string of plug-ins being initialised in turn, with no way to abort. You can switch to the multi-channel mixing selections using the Cubase generic remote window, whereupon the UC33 reverts to the more traditional eight channels of fader, pan, send 1 level and send 2 level controls, with the buttons controlling markers, on/off for the Mastertrack, cycle, and click, plus stop, play, rewind, forward, and record. I also tried the presets for AAS's Lounge Lizard, NI's FM7, Cakewalk's Sonar, and Big Tick's Rainbow software synth, and these all worked well, despite a few small anomalies in both programming and the manual. Without overlays, though, editing is less intuitive and more like using most other controllers. Hopefully more printed and blank overlays will soon become available at reasonable prices. If your synth doesn't happen to be amongst the 33 UC33 presets, you can program your own presets fairly simply if the instrument relies on standard MIDI controllers. Controller numbers can be assigned to each slider or knob by using the Control Select button and numeric keypad (or just moving the desired control), followed by the Control Assign button and a new numeric pad entry. Similarly, the MIDI Global Channel can be altered, and individual controls may be assigned their own MIDI channel. If you want to store your settings in a preset, you use the Memory button. There's also a handy Drawbar mode available to invert the fader action which is saved with the preset, primarily for use with software drawbar organ plug-ins like NI's B4. The UC33 also supports RPNs and NRPNs (Registered and Non-registered Parameter Numbers), to cope with those synths that require them for editing purposes, such as the factory presets for the Soundblaster AWE64/Live!/Audigy synth and Roland GS/Yamaha XG synths. However, it's not possible to program your own SyEx strings for detailed editing of synths such as the Roland JV1080, although Evolution get round this to a very limited extent by providing a selection of pre-programmed SysEx strings for both fader/rotary controls and the buttons, which you can access by using their clutch of non-standard MIDI controller numbers above 127. These comprise Master Volume and Pan, Master Course and Fine-Tune, Chorus Mode Rate and Depth, Feedback, Send to Reverb, plus additional Reverb type and time, and Chorus type for the assignable buttons. Other options include such functions as MMC (MIDI Machine Control), aftertouch and pitch-bend, and Note On and Off commands. Where appropriate, the buttons can also be programmed either for toggle or press/release action. The UC33's Program, Data LSB, and Data MSB buttons normally output program-change and bank LSB/MSB messages in conjunction with the numeric keypad to select new synth sounds, but these keys are also used to program extra parameters if the currently active control requires them. For instance, you can assign one of the buttons to generate a MIDI note by specifying the on and off velocities with the Data MSB and LSB, and the note number using Program. You can also transmit the current values of all the UC33's variable controls (but not the assignable buttons) by pressing the Snapshot key combination. This output is not only useful when recorded at the start of a song to initialise a particular synth with your edits, but also (when used with a MIDI monitor utility like MIDIOX) for examining the programming of the various presets. It's not as good as a proper Save function, though, and the assignable buttons aren't included, although if you press the transport buttons from left to right, followed by the 0 to 9 keys, you'll have a complete readout of every assignable control for posterity. My biggest let-down is that there's no Load function, either to upload other user presets or to back up your own (if you use the 'reset to factory defaults' key combination on power-up you'll erase all your own presets for ever). Overall, the UC33 is quite versatile, although those with hardware synths would do well to check whether or not they require SysEx for editing, since there's no way to generate this. There are nearly always two items on many musician's wish lists when it comes to buying a MIDI controller — motorised faders and rotary encoders. These both make your life far simpler when moving from one synth editor preset or set of mixer channels to another, because the faders jump to their new positions automatically, and the rotary encoders output increment/decrement data instead of absolute values, so whatever new parameter they end up controlling can be smoothly changed without any initial jumps. 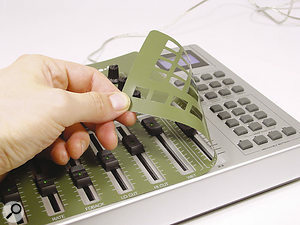 However, using motorised faders would push a controller's price beyond the budget category, and while using rotary encoders is also likely to bump up the price (Doepfer's encoder-equipped Pocket Dial costs about 60 percent more in the UK than their otherwise similar Pocket Control, for instance), there's a fundamental problem in taking this approach — how the encoders map to the software being controlled. To provide jump-free control, each software application either has to respond to inc/dec commands, or to provide feedback of the current value of the new parameter, so the controller knows what new absolute value to output when it's moved. If the software you use doesn't do either of these things, then rotary encoders won't provide you with any advantages. Several years ago, there were only a few budget MIDI controllers to choose from, but you've only got to glance through the ads in SOS to realise that the market is now awash with different models. Moreover, quite a few manufacturers, including Edirol, Evolution themselves, M-Audio (who have recently bought Evolution at the time of writing), and Novation are now selling budget controller keyboards with eight or more assignable controller knobs, all in one neat package, which will appeal to those who want basic real-time control of synths. 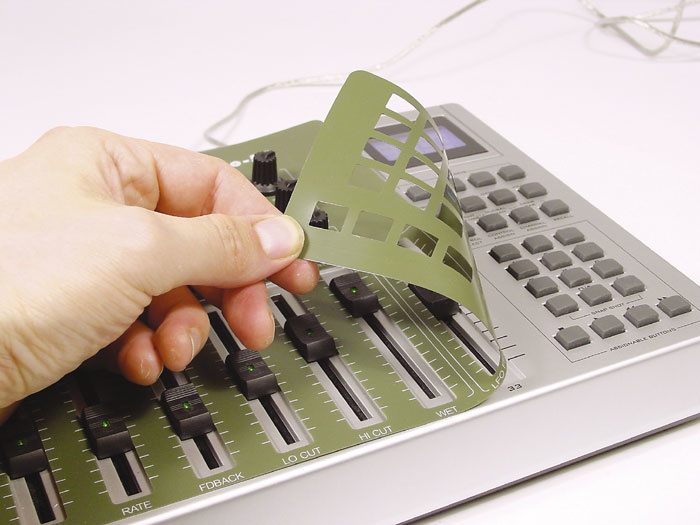 While there are also several cheaper models that offer various permutations of 16 faders or rotary controls, including Evolution's own UC16, Doepfer's Pocket series, Philip Rees' C16, and Kenton's Spin Doctor, there's little competition at the UC33's price-point if you want a more versatile product with a greater number of control options for sequencer or advanced synth editing. The closest competitor, with a typical UK street price similar to that of the UC33, is Kenton's Control Freak Studio Edition. This has 16 assignable faders, 16 assignable buttons, and a comprehensive built-in editor. It has a significantly more informative display, various extras such as external inputs to plug in pedals or other controllers, plus the ability to accept SysEx strings, which the UC33 can't handle. It also has hundreds of downloadable 'profiles', covering a wide range of hardware and software synths and applications. For me this is the weakest aspect of the UC33, since although using a total of 33 different presets is probably quite enough for many musicians, having to program some of them yourself by hand without the benefit of a computer-based editor may not appeal to everyone. On the other hand, the UC33 is incredibly quick and easy to edit, and you could probably create a new preset for the vast majority of software synths within a few minutes from a table of MIDI controller numbers, once you'd decided which control to allocate to which function. Moreover, compared with Kenton's Control Freak series, Evolution's UC33 also provides a greater variety and number of controls — and its overlays should be adopted by every other budget MIDI-controller manufacturer immediately. Overall, the UC33 is an attractive and cleverly engineered product at a competitive price, and its overlays are a masterstroke, making it easy to work without any of the 'which knob was it again?' problems you sometimes encounter when working with other generic controllers. Provides a versatile selection of 47 assignable controls. Overlays make editing far more pleasurable. Programming your own presets is surprisingly easy. USB drivers support up to 10 UC33s for simultaneous mixer automation and synth editing. Presets cannot be saved or downloaded via MIDI. No support for user-defined SysEx messages means some hardware synths can't be edited. Non-computer users may miss the lack of a MIDI merge to pass their keyboard data through the UC33. No coloured pointers on rotary controls. While more advanced users may be put off by its lack of MIDI load/save functions and very limited SysEx support, Evolution's UC33 provides a surprising variety and number of controls for the price, and is extremely easy to program. Its overlays are also a pleasure to use.